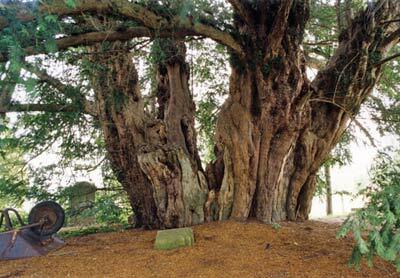 Notes: July 1999 Tim Hills: Misleading girth measurements in the past suggested erroneously that this was one of the country's largest yews. It is nonetheless a fine tree, with no fewer than 5 substantial main branches, each showing varying degrees of hollowing. Internal growth is connected to three of these branches. Four of the five sections lean outwards sufficiently to need the support of props. This vast and spreading yew conceals most of its branches in abundant foliage. Latest information: 6th March 2015 Peter Norton: The once thriving village that surrounded this church was demolished by 1836.This one female yew grows just northeast of the church. There are 5 main branches, all hollowing and at differing stages of decay. Also 6 props supporting various smaller branches, while a further 2 poles are lying on the ground. A girth of 26' 1'' at the ground was recorded.